Thanks for visiting New Jersey butterflies. For a small state, New Jersey has some butterfly diversity. About one hundred and twenty five species have been documented. Like many states, Garden State development encroaches on traditional butterfly habitat, sometimes hurting local butterfly populations. 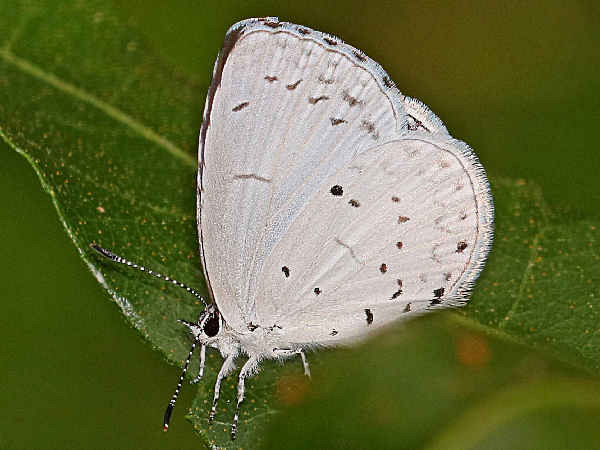 At last check about seven different butterfly species were listed as threatened or endangered in the state, including the Frosted Elphin, Silver-bordered Fritillary and Checkered White. The picture shows a Question Mark butterfly. It is common throughout the state. 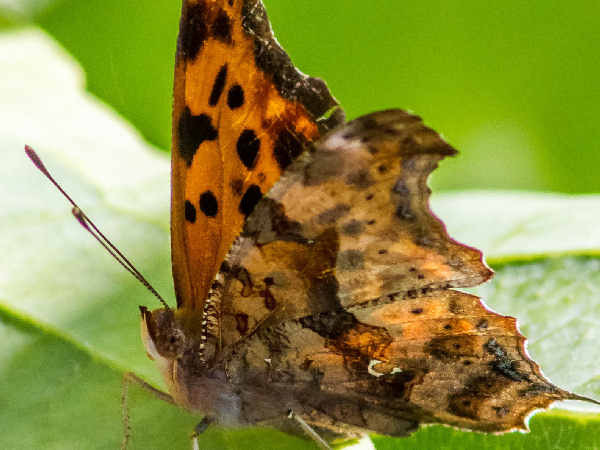 This introduction to New Jersey Butterflies provides a list of species in the state arranged according to family and by extension often wing color. The list is accompanied by a handful of pictures. Visitors seeking additional butterfly pictures and identification help are invited to press the green butterfly button button. across the state. 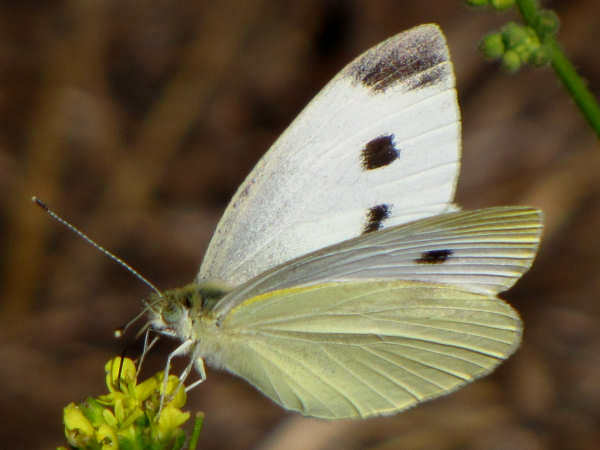 Whites and Sulphurs (Yellows) are often small to medium sized butterflies. Most of the caterpillars feed on plants from the Mustard family, suggesting that not only the Cabbage White, but all the species, can be found in gardens, parks and residential areas around the state. Because the adults nectar on flowers, they are also highly visible. The picture shows a Cabbage White butterfly. Identifying them is relatively straight forward. The upperside of the wings are white with gray tips on forewings. Males have one dark, submarginal spot and females have two. The two submarginal spots show up on the picture. 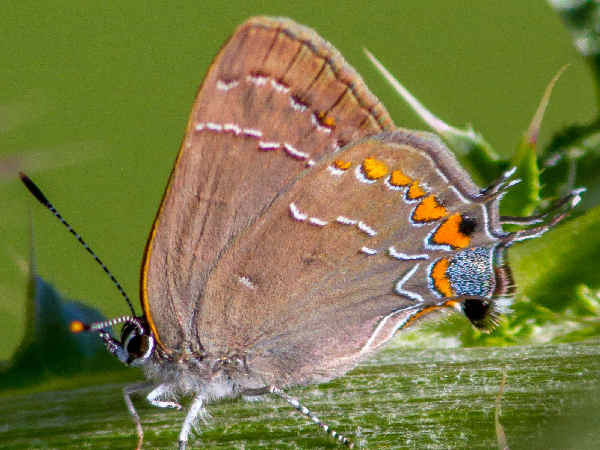 New Jersey hosts an average collection of blues, coppers and hairstreak butterflies. Almost every species can also be found in neighboring states. The picture shows an Oak Hairstreak. It’s common up and down the East Coast because of the prevalence of Oak Trees, the host trees for the caterpillars. As far as the blue butterflies are concerned, for all extent and purposes, the Eastern Tailed-blue and Azures will be the predominant species. New Jersey butterfly experts agree on the difficulty of differentiating among the Azure butterflies. Check on location. For example, the Appalachian Azure is a northern NJ butterfly species. It could also be mistaken for a Summer Azure because they fly about the same time. Look for chevrons on the wings to identify all Azure butterflies. Garden State residents and visitors get a double bonus because the brush footed butterflies love New Jersey gardens as much as the residents and visitors. These are the typically medium to large size butterflies with orange shades in the wings. Almost all nectar on flowers and their larvae feed on very common plants. Many of the Fritillary caterpillars, for example feed on violets or passion flowers, two very common plants. Monarchs and Queens are known as the milkweed butterflies. Some of the Wood Nymphs feed on grasses. All of these foods and flowers are readily available in parks and gardens around the state. 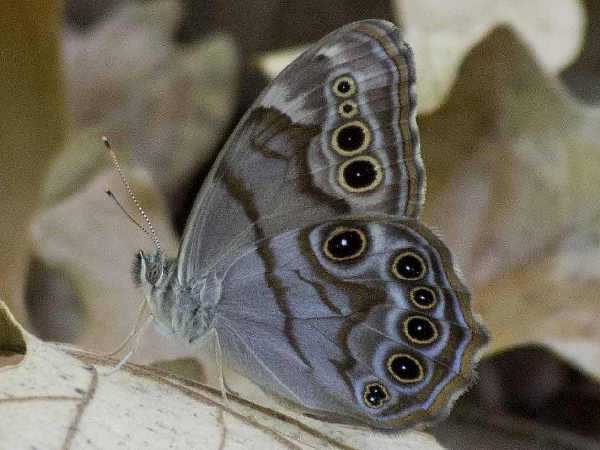 The picture shows a Northern Pearly Eye, a common Wood Nymph species. 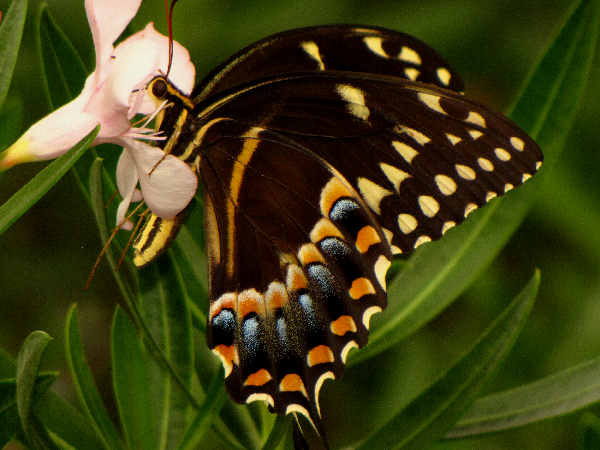 The picture shows a Palamedes Swallowtail. They and the Zebra Swallowtails get listed because of a few stray reports in the state. Usually the other five swallowtail species are abundantly found throughout the state. 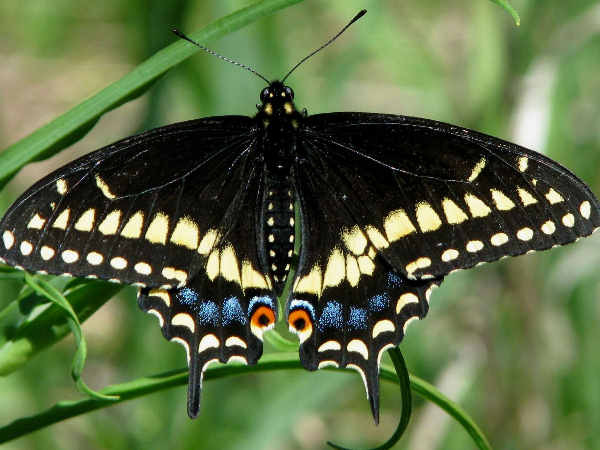 Last, but first in the hearts of the people of New Jersey is the Black Swallowtail, the official state butterfly of New Jersey. The Northern Metalmark is the only species that lives in New Jersey.